Quiet Revolution is excited to spread the word about Chip and Dan Heath’s new book The Power of Moments: Why Certain Experiences Have Extraordinary Impact. The authors answered the following questions about their book for the Quiet Revolution community. What made you want to write The Power of Moments? We found ourselves obsessed with defining moments—the moments that bring meaning to our lives, the moments we remember when we look back. Those moments could range from a wedding to an amazing vacation experience to a day at school when a teacher remarked on a talent you didn’t know you had. In the book, we talk about how we have the power to CREATE these moments. Our research suggests that people’s positive defining moments have a lot in common, and if we understand the elements they’re made of, we can make more of them. It’s like this power we all have that we’re not using right now. And when people do use it, great things happen: Businesses have more loyal customers and employees, families make more lasting memories, and teachers create lessons that students remember for years. That’s why these moments are worth investing in—they make our lives richer. How do you define a memorable, meaningful moment? It’s the kind of memory that lasts for years. The kind of memory that survives when so much of the surrounding experience has faded. Here’s one of our favorite examples of people who built a moment like that. Two friends, Chris Barbic and Donald Kamentz, helped to start a school system in Houston called YES Prep, which serves primarily low-income Hispanic families. They were sitting in a pub one night after a very long day, and they were watching ESPN’s coverage of the upcoming “Signing Day”—the day when high school football players declare which college they’ll play for. And it struck them: Why do we celebrate athletes this way but not our students, many of whom would be the first kids in their families to go to college? So they decided to do something about it. They started a tradition called Senior Signing Day, a day in May when every graduating senior is treated with the same adulation as a football player. Every senior has a moment onstage when they announce where they’re going to college in the fall. They hold up a pennant or cap or T-shirt from their school and everyone in the crowd goes crazy. The first Signing Day was held in a small theater. Today, it’s held in the Toyota Center, the giant stadium where the Houston Rockets play. Picture it: A senior taking the stage in front of 10,000 people who cheer for him or her. That’s a defining moment! And it was conjured out of thin air by two friends in a pub one night, because they thought their students deserved more. Do you have an example of a powerful moment that you created for yourself? Our research has made us more willing to fight for special moments. Recently Dan and his wife went to see the eclipse. It required a 7-hour round-trip drive with traffic both ways. It was a nuisance. Worse, as it turns out, the sky was completely overcast—they couldn’t even see the totality. And yet they are glad they went! Why? Because of that incredible moment when the world went dark, and the birds went quiet, and the insects started chirping as if it were nighttime. That’s what psychologists call a “peak” moment—the best moment of a positive experience. And what the research tells us is that people remember peaks. Two years from now, Dan and his wife won’t remember the long drive. Those memories will have faded. But they’ll never forget the daytime darkness. How does The Power of Moments relate to or build on ideas from your other books? We write our books for people facing certain kinds of challenges: Made to Stick was for people who want their ideas to make a difference; Switch was for people trying to lead change in difficult circumstances. 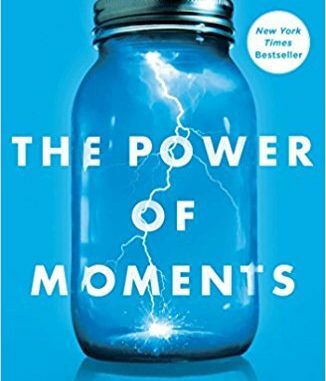 The Power of Moments is written for anyone who cares about improving experience: service executives improving the customer experience, HR managers improving the employee experience, caregivers improving the patient experience, or parents improving their kids’ experience. To improve the experience of others, we’ve got to create moments that matter. What tips do you have for our community that will help us create our own meaningful moments? (1) Break the script in some part of your life that has grown too routine. As an example, you might turn your usual Saturday routine upside down: Go for a hike, or eat out at a new restaurant, or visit some friends you rarely see, or do all three. Research shows that novel experiences make time seem to slow down—we savor them more. (2) Push beyond small talk with someone in your life. When someone asks you “How are you?”, and you’re just about to give the automatic answer, “Fine, how are you?”, take a breath. Then give the actual answer. Share something real—maybe something you’re struggling with. Trust that the other person will care and reciprocate with something real from their life. You may be amazed at how such a simple moment can deepen a relationship. Do you think powerful moments differ between introverts and extroverts? Yes. For instance, in Deloitte’s audit practice, retiring partners are honored at the group’s annual meeting. A colleague takes the stage and tells the story of the retiree’s life and career. At the end, all the partners toast the retiree, who then has a chance to address the group. It’s like a winning hybrid of a wedding toast and a eulogy. Note: We know some introverts might sooner slink into a janitor’s closet than endure this, but surely there are less public ways to achieve the same thoughtfulness, for instance a keepsake book with handwritten memories from colleagues. There’s no “one size fits all” defining moment—they’ve got to be tailored to the person. What are some typical examples of experiences that have extraordinary impact? Are there any less obvious moments that we should focus on? Well, parents provide a good example. Parents are great at creating what we call “moments of elevation” for kids—special moments that rise above the everyday. Think of birthday parties or family vacations or Halloween trick-or-treating. But parents sometimes miss opportunities to create moments that are less flashy but just as meaningful. For example, Sara Blakely, the billionaire founder of Spanx, says that she owes much of her resilience to a question her father asked at the family dinner table: “What have you failed at this week?” And if Sara and her siblings didn’t have an answer to give, he’d be disappointed. That taught her not to fear or dread failure but to embrace it, as evidence that you’re pursuing something you care about. So that’s a very simple moment—something any parent can create—that has a lifetime of significance. Answers by authors of The Power of Moments: Why Certain Experiences Have Extraordinary Impact. Copyright © 2017 by Chip Heath & Dan Heath. Published by Simon & Schuster.